This summer, 7,600 top athletes from the Americas and Caribbean will compete at more than 30 venues located across Ontario. To keep Ontarians, businesses and participants moving, there will be temporary traffic changes. During the Games, some routes will be busier than normal, especially during rush hour. Temporary traffic measures such as temporary HOV lanes on key routes across the Greater Toronto Hamilton Area will be in operation from June 29 – August 18. In addition to the temporary HOV lanes, parking restrictions, local road closures or turning bans will be in effect near Games venues to ensure participants can travel safely to and from events. 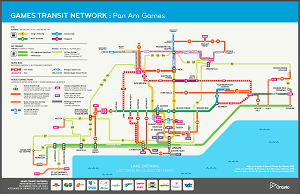 Learn what to expect and plan now to avoid delays at Ontario.ca/games2015. Triplinx is the online transit trip planner and information resource that can help make travelling by transit easy. Triplinx is a tool to help you use transit to get to the Games – whether that’s travelling a few kilometres to a local Games venue or further away in the Games region. Simply enter where you’re starting from and where you want to go, and Triplinx will suggest the best transit options to meet your needs, as well as provide any schedules, fares, or maps that you may need. On the day of your sport competition/event, just show a printed copy of your ticket to the transit operator, and then sit back and enjoy your trip. Your sport competition/event ticket is non-transferable, and your access to transit will only be valid for trips to and from the event on the date displayed on the ticket. Alert! Transit is not included with tickets purchased for PANAMANIA, presented by CIBC, the 35-day arts and cultural festival. Think public transit. Increased services and new shuttles will help you get to and from events. All Games event tickets will provide same-day access to public transit. Specialized transit (e.g. Wheel Trans) and/or limited accessible parking options for all Games venues will be available for those eligible. These services must be booked in advance. Visit TORONTO2015.org/transportation for more information. Be active. Along with public transit, cycling and walking are great ways to get to many of the Games venues. Leave the vehicle at home. We need to reduce traffic on roadways in the Greater Toronto Area during the Games. Parking will be limited or unavailable at most venues. Be sustainable. Reduce traffic by using transit and/or active modes of transportation, and share in the legacy of a more sustainable transportation network in Ontario.